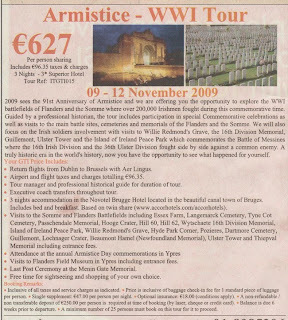 I saw this ad for a WWI tour in Friday's Irish Times. I've seen a few of these ads lately. Visiting the Western Front must be gaining in popularity. What interested me was the price: €627 per person sharing including flights and three nights in a three star hotel. Now you get bussed around the various WWI sites of interest and there's a "professional historical guide for the duration of the tour." So what they're offering in no way compares with the trips - yes trips, Did I mention we returned to Ypres in late Aug? - that I went on this summer with my family. Let me assure you that if we had to pay anywhere near €627 per person sharing we would not have been going. It can be done for a lot, lot less if you're willing to drive yourselves around in a rental car and do your own research to know where to go and what to see. A lot less - like €2,000 less for the four of us based on €627 per person. "Where've I been?," you ask. Well, I don't know. Busy, but also elsewhere. No, not out of the country - well, a little bit - but writing for Irish Central. Most of what I write is aimed at an American audience, but still -- it's ME! I've also been toying with Twitter. I know most people seem to want to dismiss it, but I'm so sure. Yet. Anyway, my twitter name is irish_eagle (not irisheagle, who is a Phillies fan of all things!). I may try to put a little twitter box on this site somewhere, but not sure where that might be yet. And, if you're sick of Nama - and am I the only one who isn't? - then this column from David Brooks about an aspect of modern America is excellent. On V-J Day, Frank Sinatra appeared, along with Marlene Dietrich, Jimmy Durante, Dinah Shore, Bette Davis, Lionel Barrymore, Cary Grant and many others. But the most striking feature of the show was its tone of self-effacement and humility. The allies had, on that very day, completed one of the noblest military victories in the history of humanity. And yet there was no chest-beating. Today, immodesty is as ubiquitous as advertising, and for the same reasons. One of the biggest problems with Nama is the presumption that the property market will one day recover. Why should it? Every day people are leaving the country. Each person who leaves is one less residence we need, one less apartment or house. And when they leave they take their spending with them, which will only add to our troubles and encourage more to leave. Our boom was made by (a) a booming American economy and role as the 'gateway' to the EU for American companies, (b) cheap credit from an economically stagnant Europe, and (c) cheap labor from E. Europe. None of those three is likely to return to levels like those we experienced between '02 & '06. We could stagnate for some time and all the while people will continue to leave. If the UK economy picks up even slightly young people looking for opportunities will be drawn there. America will be a real possibility if the visa swap scheme actually comes to pass. Australia's Chinese-funded boom will attract some Irish people too. And so on. We all know the drill. I expect the population here to decline for a number of years, which means it's entirely possible that all the undeveloped property that the state takes in through Nama will NEVER be developed. Irish taxpayers will hand over tens of billions of euros to the republic’s banks in order to write off high risk loans owed to them by the country’s builders and speculators. That is not actually correct. The banks are not "writing off" the high risk loans. They're off-loading them. Those who owe will still owe, only they will no longer owe the banks but us. The builders and speculators are not (necessarily) being bailed out with Nama. But what's really gnawing at me is the banks. What is this €54bn for? Is it simply because they lent money to people and they want it back? No, clearly not. They want the €54bn back because they owe it to others, but who are they? I'd like to see the figures, but my gut says that most of those "others" are European – mostly German – banks I'd wager. If that is true then the European Central Bank's endorsement is not that of an interested, but independent party as the Minister for Finance would have us believe. No because let's face it the ECB is really run by the Germans and they want their banks repaid. I wonder how much pressure our "European partners" have put on us to find a means to see those loans repaid. Won't the €54bn cost us anything? I like Brendan Keenan and feel unqualified to question his analysis, but something he's written about Nama in today's Irish Independent is really bothering me. Keenan argues, rightly, that the €54bn we're paying for the banks' bad property loans cannot be lost entirely because short of a complete economic collapse "those loans are worth something." True. will the loans be worth €54bn in 10 years' time? If they are, there is no cost to the taxpayer. If they are not, there will be a cost. If they should turn out to be worth more, the taxpayer will gain. Won't this €54bn cost us something? I mean, we have to borrow this money, don't we? Doesn't that mean the loans have to be worth €54bn PLUS the cost of borrowing the money? If I borrow $100 at 5% per annum and lend it to someone who pays the $100 back in 10 years I'm out $62.89 (I hope I remember my compound interest formula correctly). We taxpayers will have to borrow the €54bn to buy these wonderful property loans from the banks. I know this is a rough calculation, but ten years at 4% interest on €54bn will be about €26bn. Don't we have a right to expect to get that back too? The share price of AIB has risen by 430% (or so) over the past six months. Bank of Ireland is up over 890% in the same period! Why? Has the economy recovered so magnificently in Ireland to warrant such rises in the banks' share prices? Eh, no, just in case you were in any doubt. No, the reason the price of the shares has gone up so much is because of all the government's plans, which means that all these people buying the banks' shares know that the government's intervention - that is, Nama - will be so kind to the banks that profitability is only around the corner. And, it means that gamblers are still a big force in the banks. How do I know? I know because all these people buying the banks' shares are betting on the government actions. They have not been buying with a view to a return to the Celtic Tiger days and profits all around. No, they are simply making a bet on what Brian Lenihan will do today. Unless the Minister for Finance stings these people pretty severely today, we can all expect that the banks will - in short order - return to the sort of blind lending as described by Colm Keena in today's Irish Times. Although your average customer seeking a loan is asked to give a complete account of his or her financial affairs, this was not the case with major developers at the height of the property boom. “In the 2004/2005 to 2007 period, the borrower dictated the terms in which they did business with the banks,” according to the source. “The banks were told: ‘This is the way I do business and if you don’t give me the loan I will go to someone else who will’. And that was usually Anglo [Irish Bank]. No Sept collapse for this year's Mets! It was just about this point in the season the past two years that the Mets began their end-of-season run for second place, having calculated that first place was simply too much hassle. Thankfully, they got their collapse out of the way early this year and there's absolutely no tension left to the season. A month ago I was driving through Saratoga County late(ish) one night and I was on edge as I was worried about the number of spindly-legged young deer I saw along the side of the road. Every clump of trees seemed to be shielding a pair of deer and every so often one of them would bound across the road in front of me. You have to be careful with deer because if you hit one they can do a lot of damage to your car and to yourself if they happen to fly up over the hood, as they're prone to do. Well late(ish) last night I was driving through Dublin and I had a similar experience. Only instead of the spindly-legged young deer, I had to take care due to the number of wobbly-legged young dears who were everywhere. Every clump of parked cars seemed to shield a pack of young dears and every so often one would stumble out in front of me. You have to be careful with the young dears because if you hit one ... Uggh. It's more than past time to cull the young dears population on Dublin's streets. FÁS — What is it good for? Absolutely nothing. It's well past time that FÁS was wound up. FÁS sums up so much that is wrong with government intervention in the economy. Well-intentioned short term solutions become permanent fixtures; the mission keeps expanding - as does the budget; objectives become long-term, vague expressions of hope; corruption takes root because nobody is really holding the organization accountable; etc. I know some people might argue that the current economic climate is exactly when we need FÁS - I doubt it - but if that's true, then fine. Close FÁS and start a new organization, one with a limited life-span, tight controls and small budget. Sheesh. What's the world coming to? I can't help but agree with Winnie Mandela, who says that gold medalist Caster Semenya is a victim in all this arguing over whether she should have been allowed to compete in the women's 800m race at last month's World Championships. Mandela says "She did not make herself. God decided to make her that way and that can't be held against her." True. It can't be held against her. This is so far removed from a doping scandal, where cheating athletes have tried all sorts of excuses. "Ginseng tea," anyone? I hope they let her keep her gold medal. However, if these reports are true there's no way that Semenya can be allowed to compete against women again. The advantage she had this summer will only increase as 17 turns to 18 turns to 19 and so on. Semenya will soon be winning by half a lap. Nope, there'll be no more women's races for Semenya. While I understand her mother's desire to protect her daughter now, she knew and has known about these issues since her baby was born. Perhaps she was too naive to realize that the truth would be public knowledge some day, I don't know. I feel bad for the family because I think they were probably lying to themselves and misled by those who should have known better – like the Athletics authorities in South Africa. I cannot for the life of me understand what those people were thinking. They surely knew this would be an issue and they must also have been aware that it could be pretty rough for a teenager to go through such scrutiny. I hold them responsible for this mess and for the troubles that Semenya now finds herself in. The 9/11 season on t.v. There is a 9/11 season for television. From Sep 1 through the 11th there are just so many documentaries on September 11. It's been this way since 2002. Channel 4 definitely has the most 9/11 documentaries this year and, I think, every year. Last night they showed 102 Minutes That Changed America, which is shocking, jarring actually. I know it aired on the History Channel last year. I'm not sure if it was ever on over here before, but it sure brings it all back. I'm sure glad that I wasn't in front of anyone's camera on the day itself. Some of the people who spoke to the camera after watching the first building fall said things that maybe they would rather have been simply lost forever and not preserved on film and shown on television. Maybe. Another great documentary that was on over the weekend dealt with the conspiracy theories about the attacks. This one was on the National Geographic channel and I know it's been on before, but I never saw all of it. Anyway, it was tremendous in debunking one nonsensical myth after another and had a great line from one contributor who said the "truthers" were playing Whack a Mole - every time one of their notions is shown to be nonsense, they come back with another. You'd think that seeing as I was born in New Amsterdam I'd be fluent in Dutch, but unfortunately not. If you can read Flemish (Dutch - not sure how different they are) can you help me out? I'm trying to understand this (especially the bold bits). Om 15 uur is er in de Sint-Medarduskerk is er de Pontificale Eucharistieviering voorgegaan door Mgr. Roger Vangheluwe, bisschop van Brugge. In de kerk worden alle aanwezige missievrienden waaronder gouverneur Paul Breyne, burgemeester Bernard Heens, OCMW – voorzitter Lieve Avet begroet. Dit Diocesaan Zendingsfeest wordt muzikaal ondersteund door het koor Hoogland van Wijtschate onder leiding van Marc Lewyllie en Hubrecht De Gersem. Omwille van de heiligverklaring van pater Damiaan, de grootste Belg, zingt het koor ook het Damiaanlied. Naast de missionarissen, zijn alle jongeren uit de buurt die actief zijn in een ontwikkelingsproject uitgenodigd, alsook de jongeren die vorige zomer pelgrimeerden naar de Wereldjongerendagen in Sydney Australië. Om 16 uur stelt pater Michel Coppin, directeur Missio, aan de gelovige gemeenschap de missionarissen voor die weldra terug vertrekken en ontvangen zij het zendingskruis van onze bisschop. Het zendingskruis wordt speciaal gemaakt in een tinfabriek in Frans-Vlaanderen en is een Iers-Keltisch kruis. In de Wijtschatestraat in Wijtschate staat er zo’n groot kruis bij de ingang van het oorlogskerkhof. Dit is een granieten kruis in keltische stijl. Het werd ontworpen door generaal Hickie (commandant van de 16de Ierse divisie. Het oorspronkelijke kruis “Ginchy Cross” werd in hout vervaardigd van oude eiken balken en planken gevonden op het slagveld aan de Somme. Het stond gedurende de oorlog 14-18 tussen Ginchy en Guillemont in Frankrijk. Naar model van dit houten kruis nu bewaard in het Islandbridge War Memorial in Dublin (Ierland) werden slechts 3 granieten kruisen gemaakt en geplaatst op de voormalige slagvelden van de Ierse troepen, in Wijtschate (1926), in Salonica (Macedoniê) en Guillemont (Frankrijk). Een paar jaar terug vernoemde Koning Albert II op de televisie dit kruis dat enig is in België en dat staat in Wijtschate. Tijdens de viering ontvangen alle aanwezigen een gebedskaart met foto van het zendingskruis. Het zendingskruis is een verwijzing naar de oorlog 1914 – 1918 waarin Wijtschate volledig verwoest werd. Het gebed op deze fotokaart werd geschreven door Mgr. R. Vangheluwe. De uitleg over het kruis werd geschreven door heemkundige José Depover uit Wijtschate. I tried using Google translate and Babelfish, but couldn't quite make sense of what was happening. Three cheers for Sean Barrett. I know there have been lots of columns putting Nama down, but for me this is the best one. Straight-forward, simply-written and deadly. The builders will be relieved of their gambling debts on high property prices. The bankers will be relieved of the costs of their incompetent lending and senior regulators will no longer have egg on their faces but be reinvented as neo-Keynesian economic heroes who save the economy. It will be so easy. Nama pays off the builders at a bit less than bubble prices, builders pay off the unreformed banks and banks will immediately begin investing in productive economic activities and will never be codded by builders again, really. Nama is a macroeconomic three-card trick to refinance incompetent Irish bankers and reflate a property bubble without addressing reform in the property market, banks or bank regulation. It has dire microeconomic consequences for these sectors and adverse consequences for the rest of the economy. The proposition that Nama should pay more for impaired assets because it alone is aware of their long-term economic value is at best a gamble with public money founded on a belief that Nama knows something that no one else in the market knows about these items. This way of doing business has been agreed, we are told with some pride, by the IMF, the ECB and the EU Commission. This might be as simple as international bureaucrats rescuing national bureaucrats from a hole of their own making. We also need to know whose version of this crisis was communicated to the international bureaucracies. I love his take on the bureaucrats involved. More than anyone, they're getting away scot-free. We need competence in financial regulation across the Central Bank, Financial Regulator and Department of Finance, with massive management changes in all three bodies. We must solve the present crisis in the three sectors that caused it, bad builders, bad bankers and bad regulators. The only quibble I have with Barrett's piece is his reliance on the Canadian model. We don't control our own currency, Canada does. I'd love to ask Barrett about the euro's role in the crisis and our regulators' failure to grasp how the old rules don't apply when you have a currency priced to suit an economy to which we're only loosely tied. Can't we skip the stupid in this referendum? Everyone knows that the truth is stretched during political campaigns, but it seems that EU referenda really bring out the most outrageous lies and distortions. I was driving through Dublin on Sunday evening and saw signs advocating for a No vote, claiming that the minimum wage could be lowered to €1.84 if we vote Yes. As any of you who've been coming here for a while know full well, I'm hardly a big fan of the EU. I voted No to Lisbon last June. I'm open to reasonable arguments - from both sides. This is one is simply stupid. There is ZERO possibility that the minimum wage will be forced down to that level (or anywhere) by any EU Court. Now it may be true that subcontractors from poorer member states may earn less while working here, but that's not the same as what is implied in their ridiculous signs. This referendum is way more important than the one last June. Last June the issue may have been the same - whether to ratify Lisbon or not - but the situation has changed dramatically. Now the question is: will Lisbon be a good or bad thing with regards to our current crisis and the recovery period. I'm not sure yet, but I'd like to think we can consider the matter with at least a minimum of rationality.